Is there any way we could offset some of the loss at NK for Whitman's fuckheadery? In other words, I'd like to donate to them without making a purchase. Whitman's cost them enough. I'd like to give back. Tim, you can always buy something from them. I've ordered so many out of print games from these guys, they are super fast, and they make sure that everything is really well packaged. Their prices are reasonable, but Im sure they would appreciate the business and some advertising over a donation. Failing that just spread the good will and the good word. I placed an order around midnight on a Sunday. The next day, at lunch, I spotted something on ebay and realized NobleKnight was the seller. Great, I thought, I'll add it to my order. Nope, too late. They had already shipped my midnight order. Well I woke up to yet another email from one of Ken's 'friend's maintaining Ken 'means well' and doesn't set out to fail. I want to make it clear what happened with these books in this latest revelation. 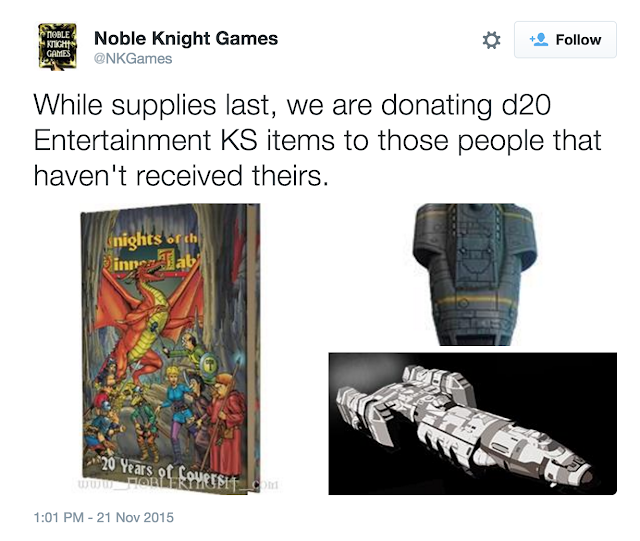 While a lot backers were complaining about not receiving their books, Ken took the books he had in hand and SOLD them to Noble Knight. We've been compiling a list of backers who never got their books. Almost all of them are European addresses. Now Ken charged $100 for these books. For those in Europe he had them prepay $40+ in shipping. So that's $140 per book (less the $17 or so to print them) he pocketed. THEN he sold them for (Im guessing $25 to $50 each) to NK for further profit. Nice work if you can find it I guess. I don't want to hear that Ken "means well" any more. Sorry, I'm a little annoyed with these most recent revealation. Learning he had the books in hands and just didn't send them out is a jaw dropper. When someone says this guy "means well" they are acting as an enabler to allow this guy to do this sort of thing to the next person in line. Got some stuff sitting in the shopping cart but the financial advisor told me to wait a few days.. But they'll be getting some of my money for sure for doing these guys a solid! Well, I am out of luck since I only backed The Castles & Crusades one. I really hope he gets caught and ends up paying for what he did. How long until Whitman tries to spin this to his benefit? NK has always been the best. Their HQ and brick and mortar store is right down the road from me. It is a regular stopping point for me. Their staff is also friendly and helpful in person, and their deals (both purchasing AND selling) are consistently good. We're lucky to have them here in Janesville, WI. I try to stop in every time I drive through Janesville, WI. Someone going by the onscreen name "ActingTeacher" claiming to be in Des Moines, IA has posted a public comment on Whitless's page all about his scandals. Also included is a link to an "Open Letter to Ken Whitman" by Jolly's wife, Barb. Whitless hasn't been on the site for a week (or at least logged in), so who knows how long it will stay. This store is in Kentucky, and is run by a Ken-Lover, so the chances of another Noble Knight happening seems remote at best. The original blogpost was about the Traveller minis showing up at the store in KY (that also appears on the Troll & Toad webstore). In response to a Comment asking if "perhaps this seller does business with Troll & Toad," there is this signed by "Ken Whitman:"
Perhaps , all the unpainted resin models have shipped, and all the painted ones are defects or damaged? Interesting. We know not all of the unpainted resin ships are in backer's hands and a lot of folks due handprinted ships are waiting for theirs as well. Fortunately Noble Knight has been able to get some of both to backer's hands. I heard more are to follow. I've heard a claim the ships in the pictures were damaged/broken ships not suited for backer fulfillment. So there is that possibility. This is curious... Whit's Stage 32 bio now says "Actor and producer in Las Vegas, Nevada"
Holy shite. Have you guys seen the recent update to his site?